November 1st, 2017, Charlottetown – Charlottetown native Andrew McQuaid takes to the ice at the Canadian Open National Qualifier short track speed skating competition in Calgary, A.B. starting this Thursday. Andrew McQuaid (#330, centre) will compete at the Canadian Open National Qualifier event in Calgary, A.B., this weekend. Photo courtesy of Kristen Binns photography. It will be McQuaid’s second trip to the elite level competiton, after competing in the same event in Chicoutimi, Q.C. last season. The Island’s lone representative will be among a field of sixty male and sixty female athletes competing for berths in the Canadian Senior and Canadian Junior Championships to be held later this season. McQuaid, in his first year of senior eligibility, has been training at the Olympic Oval in Calgary since May. He’ll be looking to improve on his 2016 results at the Qualifier, after some strong early season results this fall. At a Western Elite Circuit meet in Calgary in late September, McQuaid skated one of the fastest ever times for a P.E.I. speed skater in the 500 metre distance, with a time of 44.36 seconds. Racing at the National Qualifier gets underway on Thursday with preliminary rounds in the 1500 metre and 500 metre distances, which will continue until Saturday. Sunday will see the 1000 metre event take place. 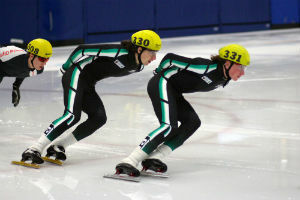 For more information about Speed Skate PEI, visit www.speedskatepei.com.